While I was definitely kept busy last week with the Backbone Project, I was also hard at work on Theodora Goss’s YA Novel Challenge, which officially began last Wednesday on June 1. I knew going into it that I wasn’t going to start with the actual prose writing by Wednesday because I needed time to plan out the novel first. I am a die-hard outliner; the mere thought of beginning a novel without any idea as to where I’m going fills me with horror. Mind you, I understand that some writers find an outline too constraining, and we all have our own creative processes, but for me, I want to have a clear plan. Maybe it goes with my list-making compulsion, I don’t know. I’ve been spending the last year learning more about structure as it relates to the novel. I’ve used the basic index card outlining method ever since my first novel, and it’s one of my very favorite parts of the process. 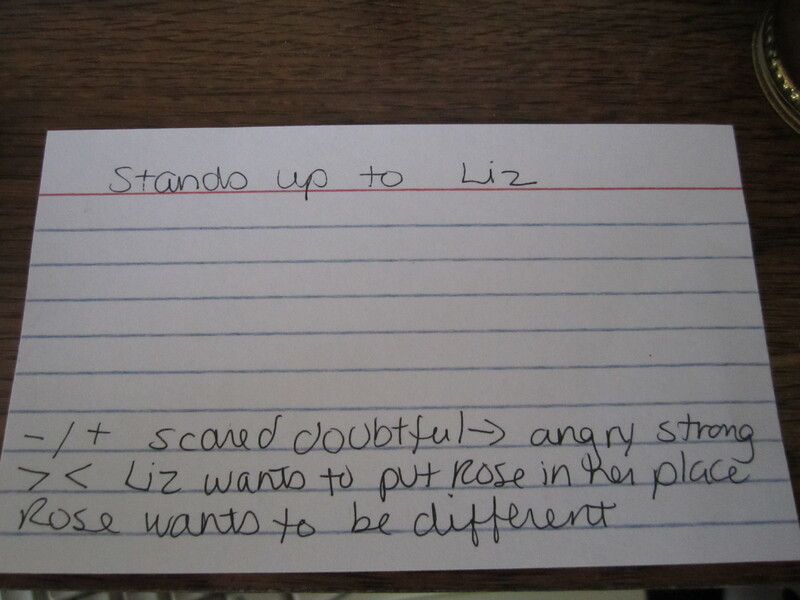 I LOVE index cards! So much less pressure than the actual committing words to the page part. At Taos Toolbox last summer, I learned about the three-act structure in more detail (which left me slapping my forehead, I might add). I then devoured Kristen Lamb’s blog series on structure (there are eight parts to this series, although I was unable to find a page that listed all of them together, unfortunately) and was completely fascinated by thinking about story in this new way. And finally, I picked up Blake Snyder’s Save the Cat, which is a book about screenwriting that spends a lot of time on structure, and devoured it in three or four days at the end of May. Now, I understand that a screenplay for a blockbuster Hollywood movie and a novel are not exactly the same in structure, but they can have a certain amount in common, depending on genre and related concerns. Plus, just as I have an inordinate fondness for index cards, I love organization of all types. I love being organized! It’s such a great feeling. So I decided to try applying some of the things I’ve learned during my outlining process. My YA novel’s working title is The Academy of Forgetting. Isn’t that evocative? I’m in love with my idea. I first conceived of it back at the SCBWI Winter Conference in January 2010, so it’s been floating in my head for a while. I’d already completed some brainstorming, a basic premise write-up, and some thoughts about characters and various “reveal” moments. Oh, and research, especially about neurobiology (which, by the by, is a crazy and fascinating subject). So last week I printed everything out so I could have it in front of me, and then I got to work on my version of a beat sheet, adapted from the one described in the aforementioned Save the Cat! This beat sheet gives me an idea of the various components of the story that need to happen, and around when they need to happen. 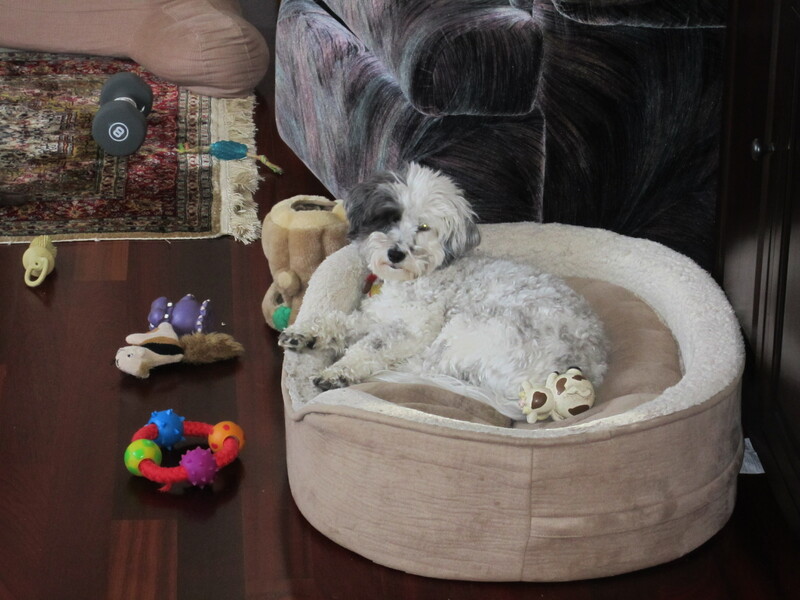 Obviously the proper work environment must include dog toys and weights…. Strangely, I ended up with Act 1 on the far right and Act 3 on the left, which feels backwards, but I decided to go with it. Luckily, I had the services of a prime story consultant, and her favorite toy cow. This kept happening once I arranged the acts in their proper order. I’m not sure if she’s so in love with the story that she wants to sprawl all over it, or if she hates it and wants to hide it from view. Maybe she believes in a Zen-like teaching method…. I know that conflict description is a bit cryptic (actually, maybe the entire card is cryptic; I chose one that wouldn’t be too spoilerific), but the important thing is that I know what I’m talking about. 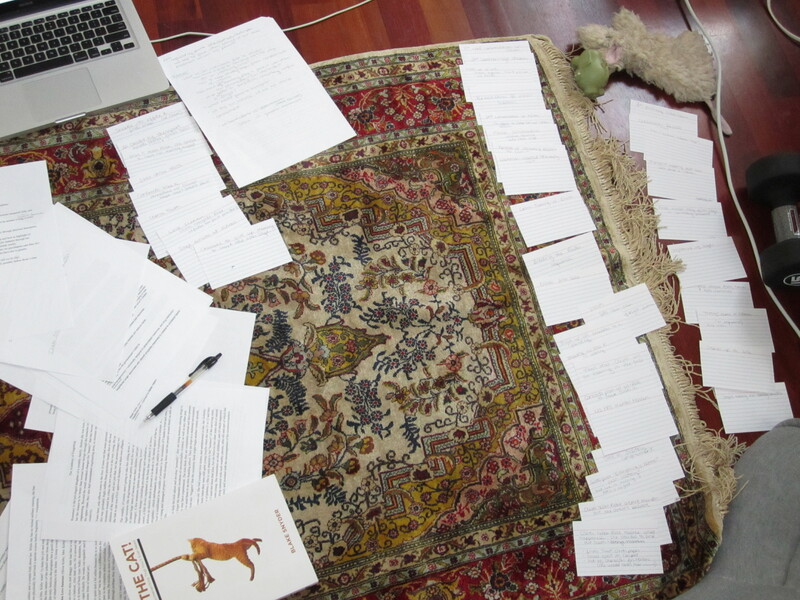 Finally, I typed up all of my cards, creating a four-page outline. To this document I added my adapted beat sheet that includes approximate page numbers of when things should maybe happen. And now I have a road map for the book, from which I can feel free to detour wildly if I don’t think it’s working. What do you think about structure and writing a novel? 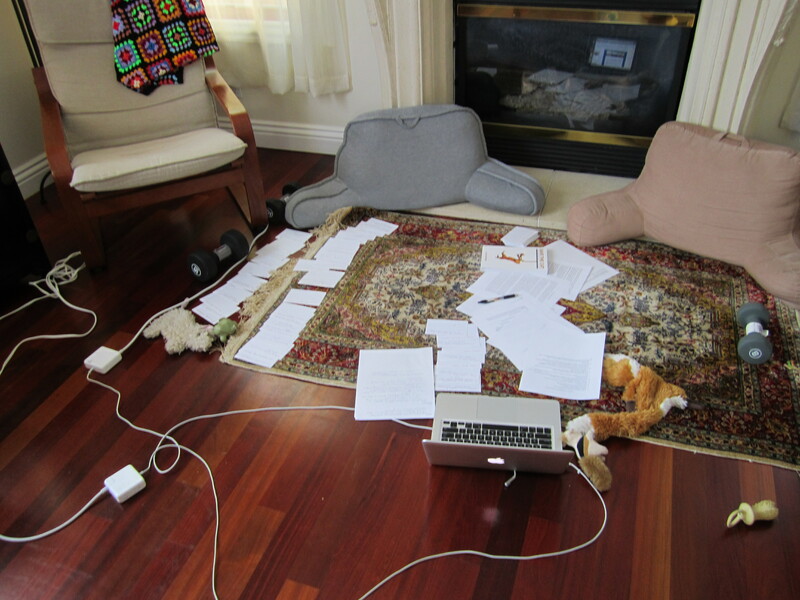 How extensively do you outline, if at all? 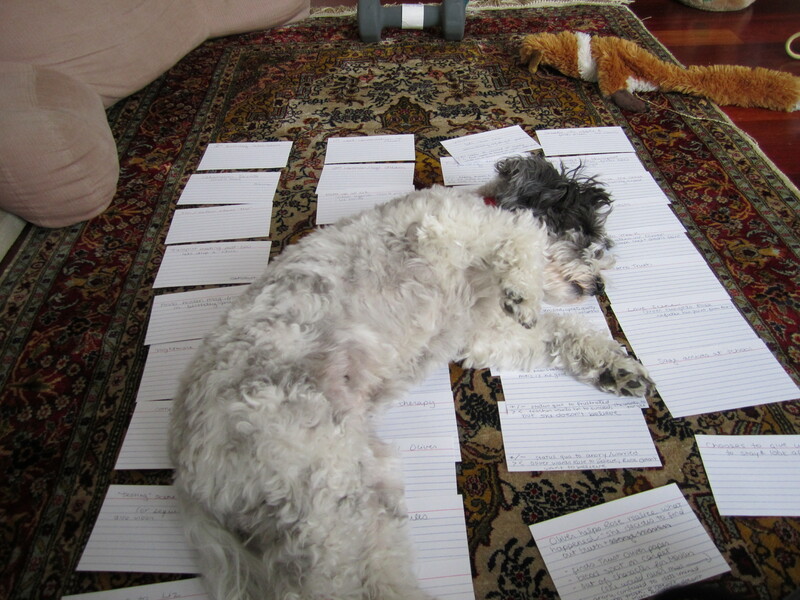 What about your process makes you deeply happy, the way index cards make me giddy? Last year, I attempted my first novel without an outline. It made it crystal clear that I had no idea what I was doing and that I am NOT a pantster. Since then, I’ve been studying structure as well. Haven’t outlined the novel yet, but I’m planning to do something similar to what you’ve done. And I thought I was the only one who got excited about index cards. They make me feel like I’m accomplishing something. I could go on and on about my love for index cards. Confession time: I also can’t throw them away. Ever. Even though all the information on the cards is neatly turned into an electronic document, I have index cards from all my projects (past and present) floating around in my office. Attack of the giant plot dog!! My plot cards tend to be just as cryptic as those. Some are general scenes, others go all the way down to a vital line of dialog. For a more involved structure or multiple POVs, colored pens help a lot. Yes, I didn’t bother with colored pens because the novel is only in one POV and there aren’t a lot of different plots that need to interweave with each other. But I can see how colors could be super helpful! I have my mythpunk novel in the form of a chapter outline and I will be converting to cards next month once I get three short stories revised and out. I have an idea for a YA novel, but it’s not gelled enough to go forward with it yet. So you do a chapter outline first and then convert to cards? Is that so you can rearrange scene order and stuff like that? Very interesting. If you ever want to plot break, I’m in, by the way! My interest in piqued! You are so organized! How do you do it? I was wondering what the index card thing was, but it looks a great idea. I am one of those who plan out my novel ideas first. I sit down, usually with an A4 notepad and have the general idea in note form. By that I have an idea of what the beginning and the middle and end of the novel will be. Then I sit down and start with chapter 1, and jot down notes on what I want to happen in it, always with a beginning, middle and an end. As I recall every chapter should be a mini story too. If I achieve this, great, if not I keep on at it. I do this until everything I had planned is written down, no matter how many chapters it takes. I then can write, using my notes, of course, I use character CV’s, where I jot down all the information on them. Each main one has their own. Plus any other notes needed are in the book along with the outline. I use house layouts, maps, and so on. Gather as much of the info I feel I will need. Then I start to write, using the notes, from beginning to end of the whole novel. Then I edit, and edit and edit and …..you get the idea. Of course I am not an expert or published (I wish), but these are my goals to achieve one day. I read somewhere to keep a book to write story ideas down, and it’s been four years now since I began, and I am still finding new ideas, some I will never have time to write, but they will always be there. I have added a A5 book and pen to my handbag, because you never know when an idea may strike. At my last count, I had over 170 ideas in my book. Now they are all typed up on the laptop and stored ready to be written. Of course I should have mentioned my genre is YA romance. I am also a member of a writing site called wattpad.com. It helps me grow as a writer, but as I said, my goal is to be published one day. Fascinating! I love hearing about other writers’ processes. Some people think I am so organized, and then I hear about what you do and I am similarly impressed by your process! Also great that you keep such good track of your ideas! I theoretically have a file to jot things down, but I often forget. Thanks 😀 wow impressed by me, and here I was thinking the same thing about you do. I am now editing for the 10th time, and hope this time will be the last time, but you never know.